I already had my menu set to make Chinese Deep-Fried Chicken Wings with Spicy Salt and Vegetarian Goya Champuru (Okinawan Bitter Melon Stir-Fry with Tofu and Eggs) before my dad left town. 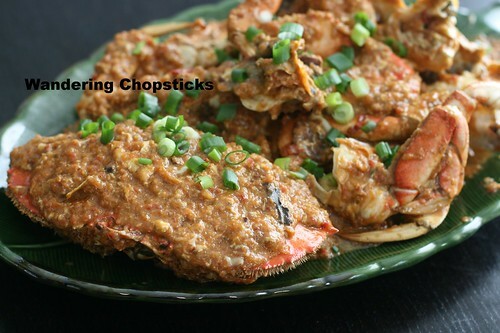 But, when I went to the grocery store and saw crab on sale for $4.99 a pound, I had to include the addition of Singaporean Chilli Crabs. 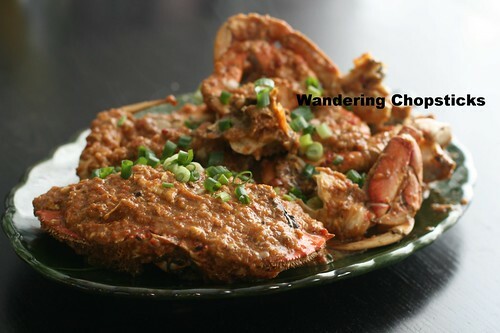 In preparation for my trip later this year, I bookmarked a bunch of Singaporean dishes to try including the famous chilli crab. 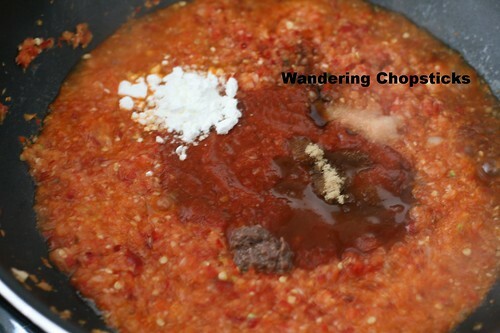 A chili pepper, tomato, brown sugar, shrimp paste, eggy sauce? Sounds right up my alley. I had two fist-sized hybrid red jalapenos that I had frozen from my tour of the Huy Fong Foods, Inc. Sriracha factory that I was saving for a special dish. This was it! 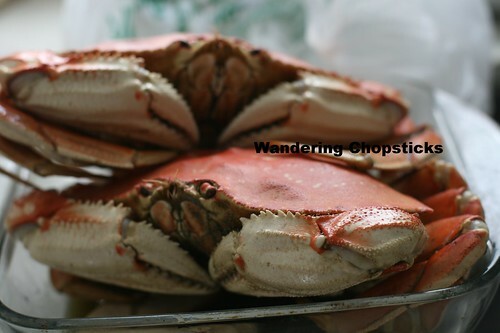 Red jalapenos aren't really spicy for me, so added with the other ingredients and the butter from two crabs and the overall dish should just have a nice kick. While I did save the shell for photos, if you're making it at home, I'd omit and save the sauce for the pieces of crab you'll actually eat. My brother and his wife and I savored each claw and leg. I fried up some Banh Phong Tom (Vietnamese Shrimp Chips), which were perfect for scooping up the extra sauce. But, steamed rolls, rice, or even Mi Xao Toi Bo (Vietnamese Noodles with Garlic Butter) Maggi Seasoning Sauce would go great with this dish as well. 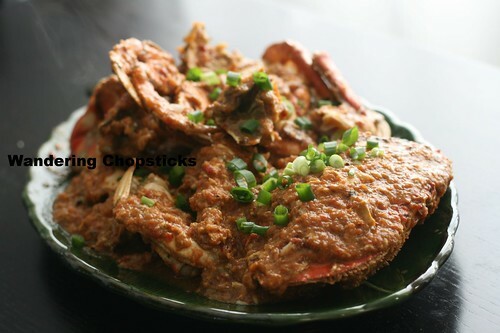 Will the Singaporean Chilli Crab I eat in Singapore this summer taste as good? I kinda doubt it? If you've eaten the real thing and make my version, you'll have to let me know which comes out the winner! 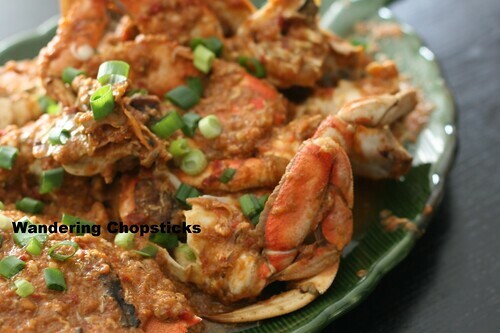 Adapted from SBS' Singaporean Chilli Crab recipe. Steam the two crabs. Remove the abdomen. Cut into quarters. Save the shell if you wish for aesthetics. Save the crab butter into a separate bowl. In a food processor, puree 2 medium onions, 6 cloves garlic, and 2 large red jalapenos. I wasn't kidding about the Huy Fong Foods, Inc.'s hybrid jalapenos being the size of my fist! It's these special jalapenos that make its Sriracha so good. 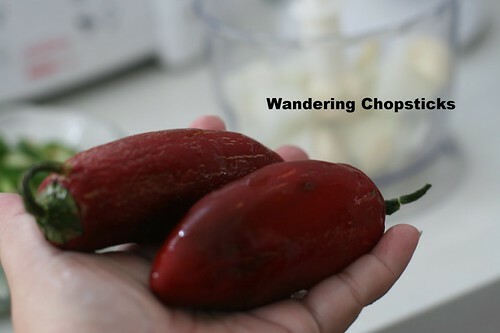 If you want to tone down the spiciness, remove the seeds before pureeing. 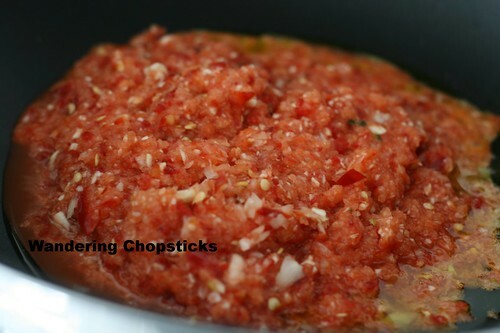 I toss the whole thing, stems and all since that's how Huy Fong Foods, Inc. does it, into the food processor. 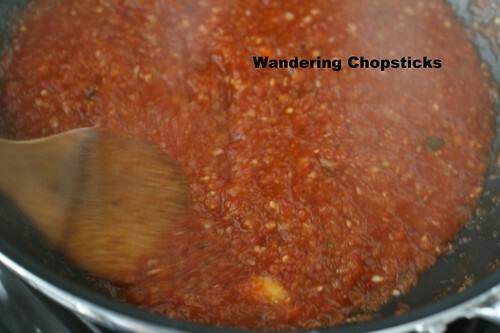 Drizzle some olive oil into a large saute pan or wok on medium-high heat, and pour the whole mixture in. 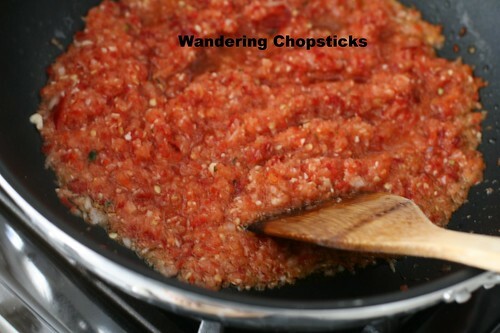 Then add an 8-oz can tomato sauce, 2 tblsp ketchup, 2 tblsp brown sugar, 1 tblsp soy sauce, 1 tblsp corn starch, 2 tsp fermented shrimp paste, and 1 tsp salt. 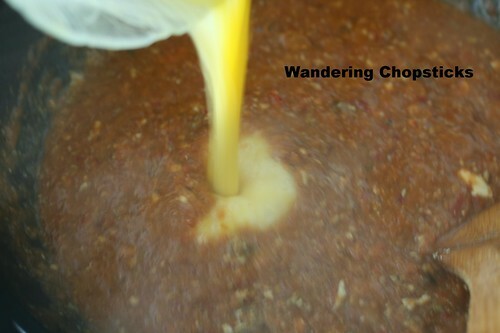 Stir for about 3 minutes to let the flavors meld. 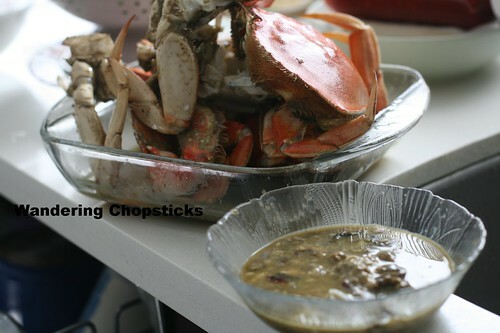 Then pour in the bowl of crab butter and stir again. Let simmer for a few minutes. Beat two eggs into a bowl. Pour the eggs into the sauce, stirring again to mix. 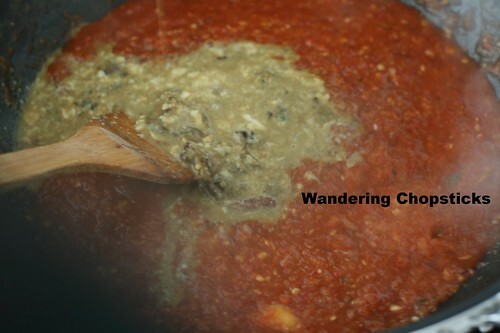 Let simmer for a few more minutes until the sauce is as thick as you'd like. Taste and adjust seasonings if necessary. 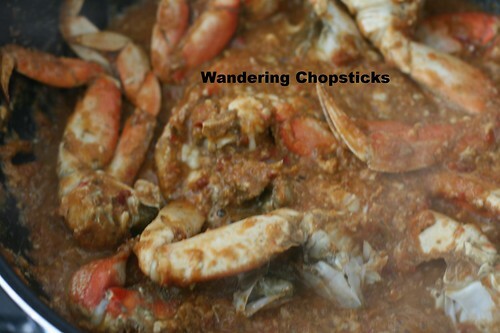 Then add in the crab legs and toss until the sauce is evenly distributed. Plate and serve. Chop up a few scallions for garnish. Look at all that glorious chili sauce! Don't you want to grab a crab leg right now? If you do want to save a shell for presentation, just place the shell on the plate and pour some of the sauce over it so you don't have any precious sauce stuck in the underside. Here, I brushed off some of the sauce so you can see. The chicken wings and bitter melon tofu stir-fry. 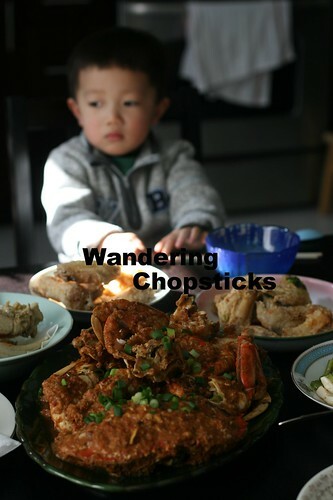 And the shrimp chips in the back. The crispness of the shrimp chips with the warm chili sauce was so delicious. I prepared some crab legs lightly battered and fried like the chicken wings for the kids. They couldn't wait to dig in! 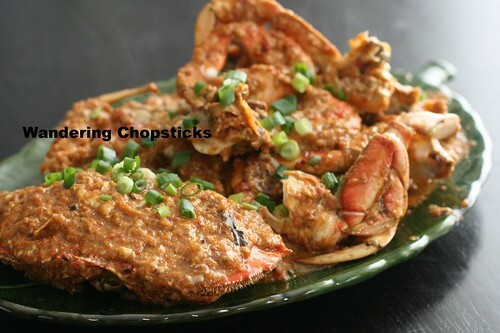 One last shot of the Singaporean chilli crabs before I go. Afterward, when I went outside to toss away the shells, I saw this amazing sunset. 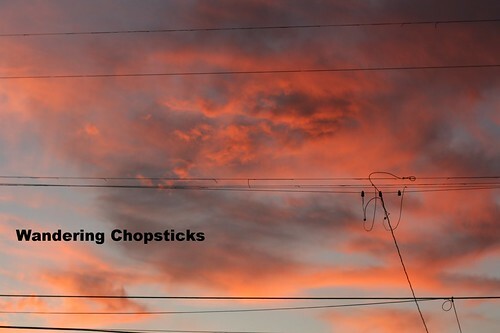 A Singaporean chilli crab-tinged sunset? I'd like to think so. 5 years ago today, How to Cook Rice on the Stove Top. 6 years ago today, Old Town Mexican Cafe and Cantina - San Diego. 7 years ago today, Mam Nem (Vietnamese Fermented Anchovy Dipping Sauce). 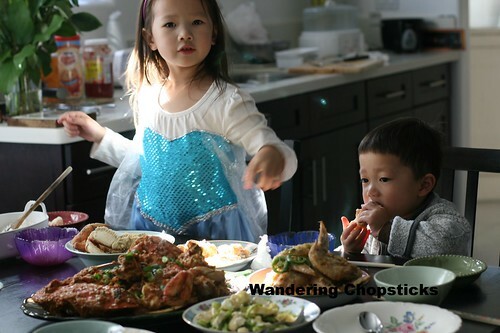 8 years ago today, overly salty dishes at Roy's - Newport Beach, and a little primer on che at Thach Che Hien Khanh - Westminster (Little Saigon). i'm excited you are coming to Singapore! that's my home country. We have other (more recently) popular crab dishes you have to try-- salted egg yolk crab, and crab and rice noodles in a hot milky broth. 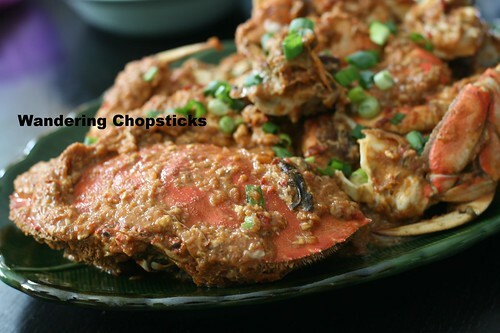 both are incredibly good, as are the regular chili and pepper crab. 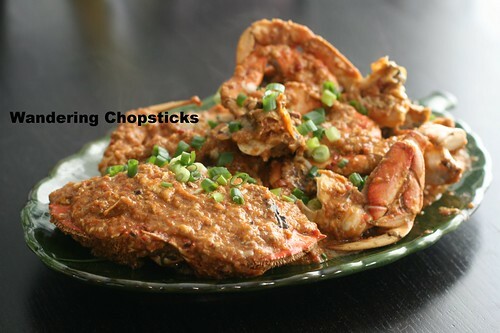 I want to try black pepper crab too. We'll see what our wallets and bellies have room for. 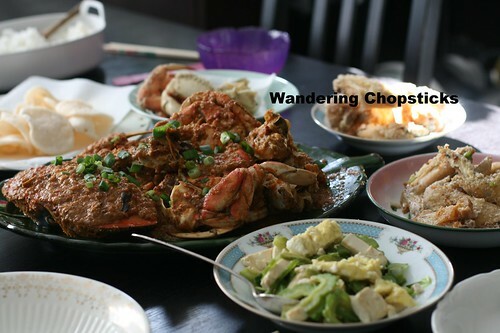 I have a few suggestions of places from a Singaporean friend, but if you've got any must-haves, I'd love to hear them!